Piper Boatworks is owned and operated by Nate Piper, who brings more than 25 years of experience in the marine industry. Growing up in seacoast New Hampshire, Nate got his early experience working at local boatyards and marinas hauling, launching, scraping and painting bottoms. 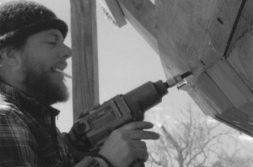 Nate is a graduate of the Landing School of Boatbuilding and Design in Kennebunkport, Maine. After completing the Cruising Boat Program, he spent the next year as a teaching assistant for the Small Boat Program, while he built a Haven 12 1/2 with a classmate. After leaving Maine, Nate sailed aboard the HMS Bounty as Crew and Ship's Carpenter. Later, Nate worked on the construction of Kalmar Nyckel, Delaware's Tall Ship. While in the Mid Atlantic, he sailed as Crew and worked on a major refit of Martha Lewis, a Chesapeake Bay skipjack. Returning to New Hampshire in 1997, Nate started Piper Boatworks. Over the course of 20 years in business, Piper Boatworks has worked on boats ranging from two Chaisson Dories, restoration of a 36' Joel White designed cutter, major hull work on a 55' Alden, to major structural repairs on the 70', 40 ton gundalow, Edward H. Adams of Portsmouth, New Hampshire. Nate has also worked on the rebuilding of the Boston Tea Party ships in Gloucester, Massachusetts, and worked with Harold Burnham on the construction of the Schooner Yacht Isabella in Essex, Massachusetts. Nate was the Project Manager for the construction of the gundalow, Piscataqua in Portsmouth, New Hampshire, which launched in 2011. In 2016, Nate founded The Boatshop at Strawbery Banke, a partnership with the historic museum in Portmouth, as a way to explore and celebrate maritime skills, experiences and traditions through hands-on boat building, workshops, lectures and other activities. In addition to his ongoing restoration and repair work, Nate is the only authorized builder of new, numbered MerryMacs. the beloved design by New Hampshire boat designer and builder Ned McIntosh.